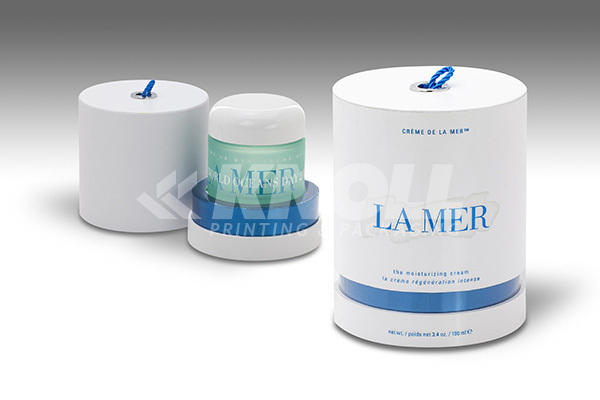 Products – Round - Knoll Printing & Packaging Inc. Round cardboard coffret wrapped with textured art paper and personalized with a visible blue neck. What at first glance appears to be a tall circular box, actually opens up into a three tiered box. The first two tiers each contain a product resting in a vacuum form, with the third tier the cover. The entire box is wrapped with a registered wrap on gold mylar with a tassel hanging off the cover. 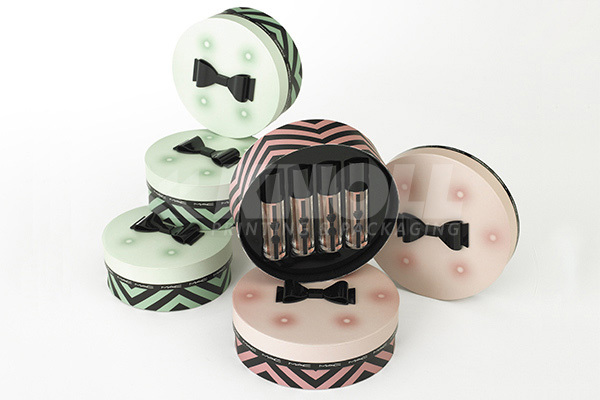 Fantastically well designed rounds, the outsides are printed and wrapped in either a match black or pink, "wrapped and tied" in a Victor & Rolf's signature ribbon style. 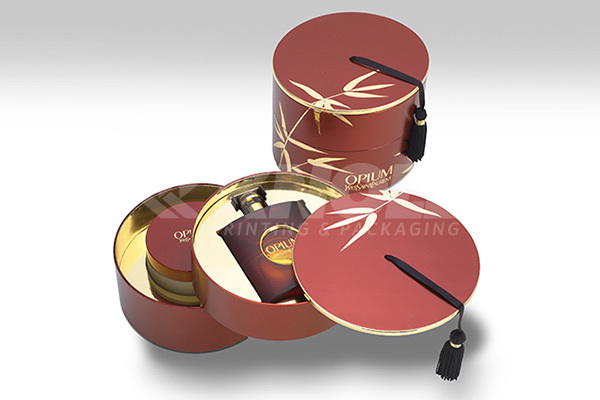 Within each base is a black flocked vacuum form, holding securely the products. These fun small round boxes are printed with an intricate patern matching around the base and cover. Attached to the cover is a gifty injection molded bow. Inside the base is a gloss solid black vacuum form. 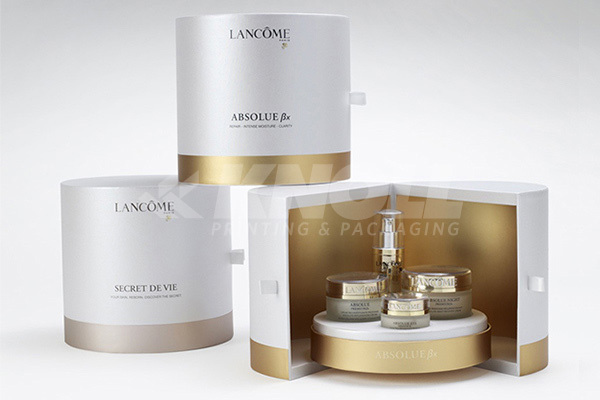 These luxurious boxes are the perfect package for these luxury products. Pearl wraps are printed custom colors and are guilded with matte mylars. 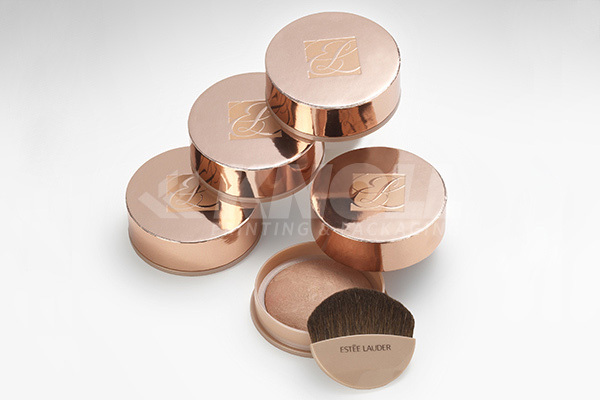 This round makeup compact box is a perfect combination of a plastic injected mold base and a board cover. The cover is wrapped in a matching shiny custom color mylar with the logo printed in matte varnish.